London’s easiest and most accessible airport is just under 10km away from the heart of the city in zone 3. You can reach it by Tube, interchanging at Canning Town, Stratford or Bank, to get to Docklands Light Railway (DLR) that runs every 8 to 15 minutes. If you have an oyster card for zone 1-3 anyway, you don’t have to spend anything. Otherwise you pay a maximum of £3.30. Heathrow Airport is located in Zone 6 and has direct connections to London city centre, including one from London Paddington via Heathrow Express with a journey time of 15 minutes. If you book more than 90 days in advance, you can get a single ticket for £6.99, otherwise it can get pricey and I would only suggest to take the train if you’re really in a hurry. The cheaper option is the Piccadilly Line (Tube) with a journey time of one hour and a maximum cost of £5.10. Buses and coaches are available as well but I would only take them if you stay in West London. National Express and easyBus services link passengers from more than 400 destinations across the UK to the airport. The buses in London depart from various stations including Waterloo, Victoria and Ear’ls Court and ticket prices start from only £2. It takes approx. 1 hour to get to Gatwick airport but always plan in more time because the traffic can be very bad in London and you don’t want to miss your flight. From London Victoria, you can also board the Gatwick Express and arrive in only half an hour. I’ve done that once because I was in a hurry but with single ticket fares starting at £17.70, I would suggest to take the Southern railway departing from London Bridge which only costs around £8 and takes about the same time. If you’re travelling light and don’t mind breaking a sweat before check-in, consider cycling along NCR 21 as it runs right through the airport. Bicycle parking is free and shower facilities are located in the South Terminal. I would only recommend that if you live in South London. The journey from St Pancras International on Thameslink can take as little as 21 minutes, but the average time including the bus transfer from Luton Airport Parkway train station to the terminal is about 40 minutes. If you stay in North London, I recommend the board in the train in Kentish Town or West Hampstead because fares are cheaper than from the centre. A wide array of bus and coach services operate at Luton too, including National Express, easyBus and greenline. The Stansted Express, compared to the express rail links to Heathrow and Gatwick, take a bit longer to get to the airport from London Liverpool Street, with the journey time being 47 minutes. Again, if you book tickets in advance online you can pay as little as £8 otherwise you have to pay a hefty £19. National Express, Terravision, and easyBus have routes to and from the city centre and travel times range from 45 to 100 minutes. Fares are generally cheaper and start at £2 per route. If you take the National Express via Golders Green, roads to the airport can get extremely busy during peak times, so do add some extra time. My brother had the take the coach the other week on a Saturday afternoon at 16:00 and it was delayed by 45 minutes. Luckily he was able to board an ‘earlier’ coach at 16:20 and he just about made it in time (18:45 departure). Seats are extremely limited, so do leave at least 4-5 hours before departure to be on the safe side. Early mornings are fine though and it shouldn’t take more than 1 hour from Golders Green. If you have a car and live in close proximity to the airport, it might be more convenient to drive directly to the airport car park, and then take the shuttle bus from Mid Stay parking to the Stansted terminals. From central London, the only connection you have to Southend Airport is by train. A trip from Liverpool Street station will take 53 minutes while a trip from Stratford Station will take 44 minutes. The station is right next to the terminal and a single ticket costs around £14.90. If you’re coming from anywhere in Chelmsford, Central Southend, or the local South Essex area, you may take the local bus services Arriva 7/8 and 9. Anyone coming from Stansted Airport can also access Southend by embarking the X30. If you prefer to take the train, I would also look into getting a railcard. We’ve got a ‘Two together Railcard’ that saves us 30% each time we take the train, so it pays off very quickly. Overall, there are plenty of options to get to London’s airports on a budget, you just need to bring more time and book in advance. 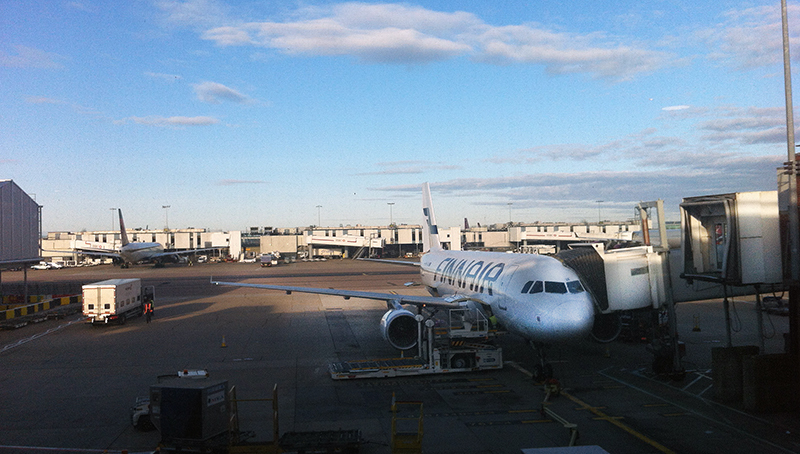 What are your tips to travel to London airports? Do you have a favourite airport in London? London is a beautiful city. And the tips are very useful. Thanks for sharing.